The U.S. is keen to find new markets for its F-35 fighter. India and Japan would certainly fit the bill. After years of development, U.S. government and defense industry representatives have actively started the process of selling the F-35 Joint Strike Fighter (JSF) overseas. Recent focus has fallen on India and Japan, two Asian powers that Washington sees as important to its future involvement in regional affairs. The United States’ 4th generation (F/A-18 and F-16) offerings were rejected by India, with European manufacturers Dassault and Eurofighter the only finalists for a whopping $10 billion contract. Still, the Pentagon recently invited India to consider information on the Joint Strike Fighter for future purchases, labeling the craft the world’s premier fifth-generation platform and highly suited to the requirements of the original competition. This clear shift emphasis on the part of the Obama administration and the Pentagon underscores the U.S. government’s vision of close Washington-New Delhi cooperation, and demonstrates a growing willingness to interface with India’s military endeavors on a new level. With that in mind, and considering that India’s expanding military modernization plans go far beyond the current competition, it seems very possible that the F-35 may find itself based on the subcontinent in the foreseeable future. In Japan, meanwhile, officials announced that the F-X program, a competition to pick the country’s next combat air platform, has become a two horse race between Boeing’s F/A-18 Super Hornet and Lockheed Martin’s F-35. With its previous attempts to purchase the F-22A, along with Japanese officials’ stated preference for fifth generation technologies, it’s clear that the JSF is in a favorable position. For those policymakers that support JSF production, and those manufacturers that have become dependent on its success, these potential new markets extremely welcome. Pressure is mounting in Congress to include the JSF in future Pentagon budget cuts, but new export ventures could help alleviate both the rising price-per-unit costs (now almost at $150 million) and much of the mounting pressure to scale back production of the new sophisticated carrier based F-35B variant. In terms of tactical capabilities, the Joint Strike Fighter makes substantive sense for both nations. India and Japan are looking to create diverse forces that can provide advanced air superiority, interdictor and strike capabilities in the context of the relatively proximate threat posed by numerically massive Chinese ballistic and aerial units. Adding the F-35 would compliment the abilities of more numerous 4th generation aircraft and help build a strong balance of capabilities amongst powers in Asia. This is particularly the case for India. From the Su-35 family of Russian aircraft to the advanced FGFA heavy fifth-generation stealth fighter, the capabilities garnered from New Delhi’s current range of procurements will enable the country to field a diverse force structure to meet future challenges. In India’s case especially, it’s worth noting that the FGFA, a future variant of the Indian-Russian PAK-FA fighter, is intended to serve in the same land-based air superiority platform role as the U.S. F-22A Raptor, with advanced thrust vectoring, stealth detection and air-to-air combat capabilities. This would complement the F-35’s primary role as a stealthy interdictor in modern aerial warfare mission profiles. Moreover, the naval variants of the JSF may well find themselves extremely attractive to the Indian navy in the future as an alternative to the current 4th generation HAL and MiG aircraft, with the F-35B and C models both capable of being launched from soon-to-be-introduced domestic- and Russian-built carriers. Despite its many advantages, the biggest obstacle to the F-35 has been the snail-like development cycle and the rising costs associated with buying and operating such an aircraft. Selling the F-35 to India and Japan could remedy this and revitalize the JSF’s stagnant future. 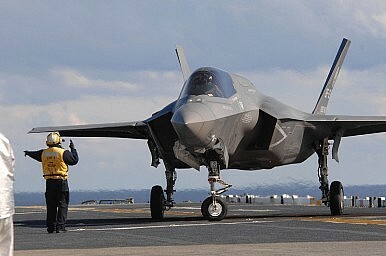 With the F-35 nearing full production, and with final testing underway on its naval variants, the United States has indicated its willingness to approve at least partial technology transfers, a move that makes JSF procurement more economically lucrative for all parties involved. Ultimately, a future that sees the F-35 in Asia’s skies can only benefit the United States, both financially and strategically as the U.S. moves closer to key allies. Christopher Whyte is a Washington DC area analyst and graduate student in Political Science in International Relations at George Mason University, Virginia. While the America’s 5th generation fighter has been cleared to soar, could another problem be emerging?